Kamus + Keller Interiors | Architecture (KKIA) has found a new home at the Landmark Square building at 111 West Ocean Boulevard. KKIA, which also has locations in Downtown Los Angeles, Westlake Village and San Francisco, is a born and bred Long Beach firm, previously operating out of the Ocean Center Building and Catalina Landing. 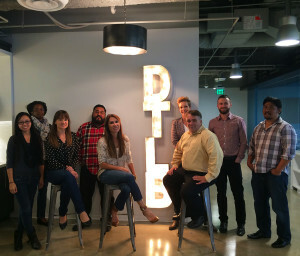 The 20-person regional office serves a varied range of corporate clientele from Orange County to West Los Angeles, including the Downtown Long Beach Alliance (DLBA), AT&T, and the Landmark Square building itself. To learn more about the KKIA’s journey through the moving process, check out interviews with President|CEO David Keller, Interior Design Director Cheri Bancroft, and Senior Designer Karin Ross. And for more pictures of the work-in-progress space, visit KKIA’s Facebook page.